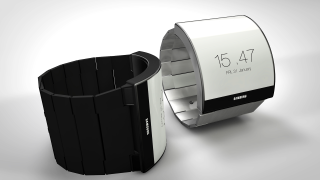 The launch of the Samsung Galaxy S5 later this year is expected to be a double-prizer, with a radically redesigned Galaxy Gear 2 tipped to land alongside its smartphone companion. The original Galaxy Gear was okay in many regards, but the combination of a lofty price tag, poor UI and limited functionality - not to mention that less than acceptable battery life - left us wanting. Could our prayers be answered with the Galaxy Gear 2? If so, we've got a number of boxes Samsung will need to tick if they want to win our hearts. We're not going to list them here (lists are so 2013, don't you know?) - instead, we've gone the extra TechRadar mile and put together a super slick 3D concept render for your eyeballs to enjoy. Check it out below, then leave us your thoughts in the comments.